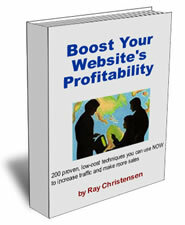 Boost Your Website’s Profitability: 200 proven, low-cost techniques you can use NOW to increase traffic and make more sales is the book I wrote to help you have online success! It’s your guide to building an effective site at minimal cost, even if you have little or no technical knowledge. Business owners and website administrators get to the bottom line for the least amount of time and financial investment. Step by step instructions and numerous lists of ideas for every aspect of your online marketing campaign! Essential tips that will bring more traffic to your site and convert them to paying customers. to grab the attention of your prospects before they click away from your site (possibly forever). Email or call my personal line with any questions: (302) 633-1482. Keep navigation consistent and clear – make it easy to find things on each page. Ensure easy access to each page. Large sites may need a Site Map, Search Feature or drop-down menu. San Francisco, Seattle, and everywhere in between!